The Pennsylvania State Association of Boroughs (PSAB) established and fostered a program that encourages Boroughs to have a high school or college student, that is a Borough resident, participate in the workings of local government. Mayor Judith T. Wagner was instrumental collecting and organizing the necessary information in order for the Borough to become a participant of this program. 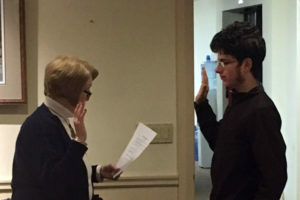 At the Borough’s reorganization meeting held January 2nd, the Borough adopted a resolution authorizing participation in PSAB’s Junior Councilperson Program, and Ezra Buonopane, a Lewisburg High School student, was administered the Junior Councilperson Pledge and appointed by Council to serve as the Borough’s first Junior Councilperson. Please see the photograph from that evening.